The ms Statendam arrives early in Hilo, and docks at the pier in the harbour. I have some breakfast and gather up my cold weather gear for my big trip up to the summit of Mauna Kea. I disembark, find the shuttle to Harper’s Car & Truck Rental. and rent a 4×4 Ford Ranger truck, which Harper’s allow on the Mauna Kea access roads. 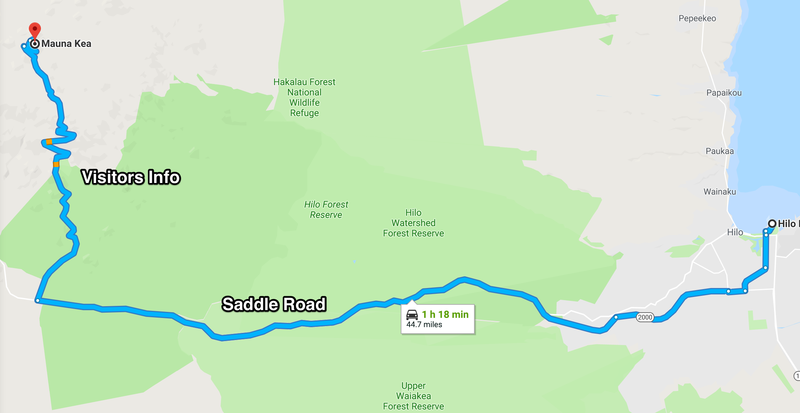 Once I’m off in my little truck, I work my way out of Hilo and drive up the Puainko Street Extension, which becomes the H200/H2000 Saddle Road. I stop to pick up some refreshments from a corner store, since I will skip lunch. I’m glad I brought along my vehicle GPS from home, which guides me through several complicated twists and turns until I get out of the city. 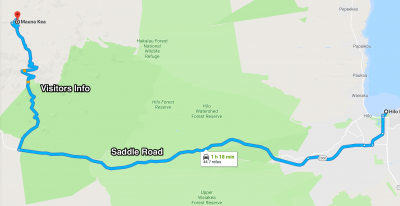 The first half of the 45-mile drive to the summit takes me along the Saddle Road Highway (2000), a paved 3-lane road all the way to the Mauna Kea Access Road turn-off, and then to the Visitors Information Station (VIS) on a good (but steep) 2-lane paved road all the way through ranch country. I stay at the VIS for 45 minutes in order to acclimatize myself to the elevation change (sea level to 9,000′), and then put the vehicle into 4-wheel drive and start up the gravel road to the summit. The road surface is washboard, so having 4WD is great to keep traction and stability. A few miles before the summit, the road returns to a paved surface, since dust control is a big factor with these expensive observatories. There is snow on top, and the air is clear and cold. I pull on my winter coat, which I have been dragging around with me on this trip just for today’s adventure. It is wonderful to finally see all these observatories in person, especially the ones Canada is involved with. The Canada-France-Hawaii (CFHT) observatory has a prime location on the end of the north ridge, and is a beautiful, brilliant white structure. The Gemini North observatory is next to CFHT, and is a silver structure with bulging air vents all around the lower part of the dome…again, a very beautiful design. I drive around to see all the observatories up close, but unfortunately I can’t stay for the VIS’ tours inside some of the facilities. The sky is a deep blue and crystal clear, and the observatories are stark white or silver, so I use the High Dynamic Range feature of my Canon 6D dSLR. This allows me to capture the scenes much more successfully. I shoot lots of photos, since I probably won’t return to Mauna Kea again. I can see the summit of the mountain and the trail leading to it from Gemini North, but I have to be careful to not exert myself too much while at 4,205 metres (13,792′) elevation, since the amount of oxygen available up here is less than half than at sea level. Reluctantly, I have to return to my cruise ship, so I start the drive down the mountain, with my vehicle in low range 4WD and in 2nd gear as well. I barely touch the brakes for the whole way down the mountain until I shift out of 4WD at the VIS before returning to paved roads. The return trip to Hilo and sea level goes without a hitch. I return the vehicle to the rental company, and I’m back on board the ship a couple of hours before departure time. This entry was posted in Hawaii, USA and tagged 4WD, astronomy, car rental, GPS, map, mountain, observatory, summit, telescope, volcano. Bookmark the permalink.